We've been lucky the past few years and have rarely run into a long line at airport security, but this year was different. We normally go through the north security checkpoint, but the line at the next one looked shorter. As we got closer, we noticed that whole checkpoint was only for TSA Pre. We continued to the central checkpoint, and the line was spilling outside the switchbacks. We shrugged and joined the line. As we progressed, several new switchback segments were opened, so we ended up doing a lot of walking. While we were between a couple such advancements, we heard an agent saying that no dogs were allowed at this particular checkpoint, but they were at the next one; we looked up, and there was also a sign saying that. He then specifically told a couple people that no dogs were allowed. Once we got past security, we went through our usual routine of getting drinks from Dilettante, hang out at a table, then get fish tacos for lunch. After that, we proceeded to our gate and waited to board. It was pretty cold on our way to the airport, but there was no precipitation. Looking out the window at the boarding lounge, we noticed it was starting to snow. Not a lot, and not sticking, but still, it was the first snow of the year; the plane needed to be de-iced after we boarded. My parents picked us up and we got back to their house early enough that Melody and I had time for a walk. We ended up going to the grocery store to pick up a few things; the distance was good, giving us about an hour of walking. We were also able to enjoy some holiday decorations on our way back. We arrived back at the house after my aunt showed up, then all of us went out to dinner. After that, we returned to the house, chatting while I formed an balls, then we all called it a night. We packed the car in the morning and made our way to my cousin's place for mochitsuki. People were still gathering, so we had a chance to chat a bit before things got started. Once things got going, they went quickly. Several years ago, there would be a batch, then there was a generous break before the next one. We used to start mid-morning and end around dinner time. We began to start a bit earlier, and there was a bit less time between batches; one year we finished in time for a 1 pm lunch. This year the batches came back-to-back; we had at most a few minutes' break. 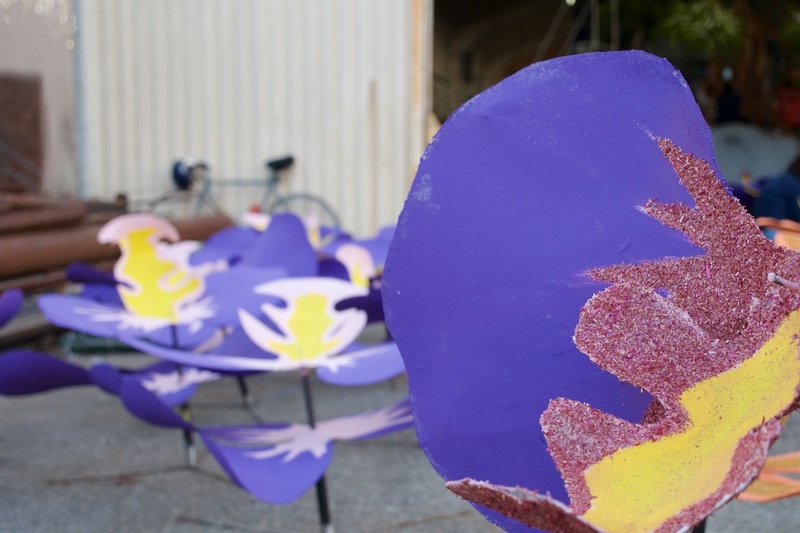 Even so, it took us a little longer to finish up; last year we had about 130 pounds of rice, so we must have had quite a bit more this year (or the batches were smaller). We did take a break for lunch, then finished everything up in a little more than an hour, not including the time needed for the last batches to cool before packaging. After all the mochi was in bags, we started packing everything up. This was the last year at my cousin's house after probably about a dozen years of her hosting it. Before that, it was at my parents' house, where it was since I was a little kid. Next year another cousin will start hosting the event, so we'll need to figure out a new routine. We dropped off some mochi at Lyon Art Supply for others to pick up, saying a quick hello to my aunt. After we returned to my parents' place, Melody and I took off on another walk. We once again went to the store, since my mom wanted some groceries so she could make a yam casserole for dinner the next night. On the way back, we took a quick detour down a street where I remember there being a holiday train (complete with a conductor who walked up and down through the cars) but alas, it was no longer there. It's not too surprising, actually, since I last saw it probably 35 years ago. Being ready for dinner after our return, Melody and I snacked on some leftovers we had brought back from mochitsuki, then called it a night. Tuesday was our last full day in California, and we took the opportunity to play tourist. We decided to go to Little Tokyo, but since we didn't want to deal with having a car around Downtown, we went to the nearby light rail station, filled our cards with day passes, and hopped on. 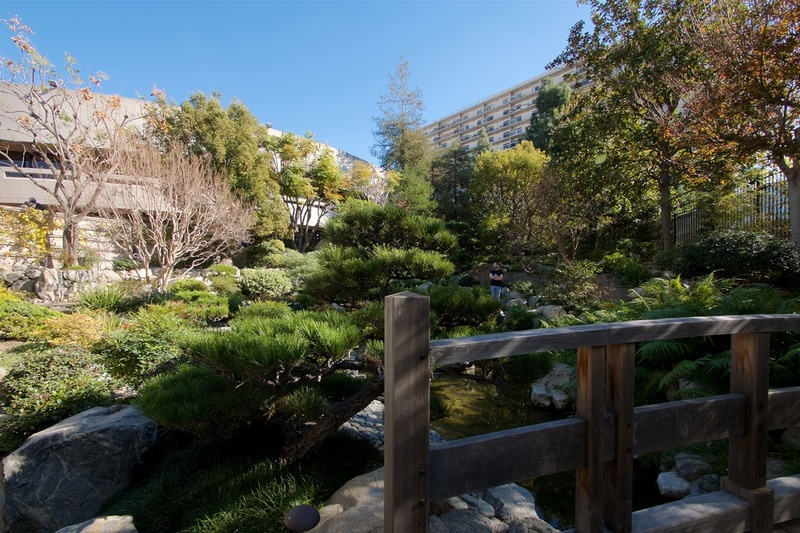 We ended up taking three trains to get close to Little Tokyo; green line to Willowbrook, blue line up to its terminus at Metro Center, then a red line for a couple stops to Grand Park. As we got out of the station, we realized we were right next to the Walt Disney Concert Hall; I hadn't been there before, so we wandered over. It's odd to see something which is so reminiscent of the Experience Music Project, but all in silver, rather than the various colors. We took a peek inside but weren't able to go up to the hall itself. Getting back outside, we went up the exterior stairway and walked around the upper level, taking in the sights and the different angles of the building. There was also a public garden up there, as well as a fountain sculpture. After finishing up at Disney Hall, we walked east on 1st Street, arriving at Little Tokyo. We wandered through the Japanese Village Plaza towards the garden in the Japanese American Cultural & Community Center. We found the garden and were surprised at its size (quite small, but still a lot of things in it). There were fences all around the garden, and we didn't see a way in. After walking all around outside the garden, we stepped into the Center to see if there was someone we could ask, but the information desk was empty. A guard followed us in and asked if he could help us, so we asked about getting into the garden. He had us sign in, then told us to go down to the hallway, turn left, and then follow it outside. We didn't expect to be walking past what looked like a bunch of offices, but eventually saw the door outside and stepped into the James Irvine Japanese Garden. There were a few people wandering around, and you could see the entire garden from about every vantage point. However, all the major features were there; bridges, waterfalls, stepping stones across a river, and the plants. They sure packed a lot into the small space. Feeling like we needed a quick snack before walking out to lunch, we stopped by a pastry shop and got a chocolate cream puff. We ate it outside where we could watch the people milling around, choosing between the various noodle shops. We then walked past the Japanese American National Museum, turned onto Alameda, and headed north. We thought we would be able to see the Go For Broke monument, but since it was further over, we decided to leave that for another time. Instead, we had a singular goal of getting French Dipped sandwiches. 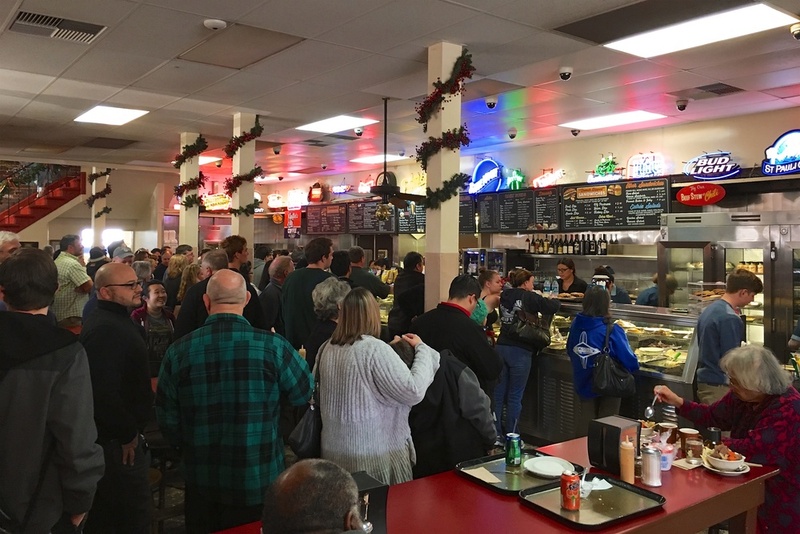 We arrived at Phillippe's and the lines were long, but we've seen worse. Melody went to find a table while I got the food. 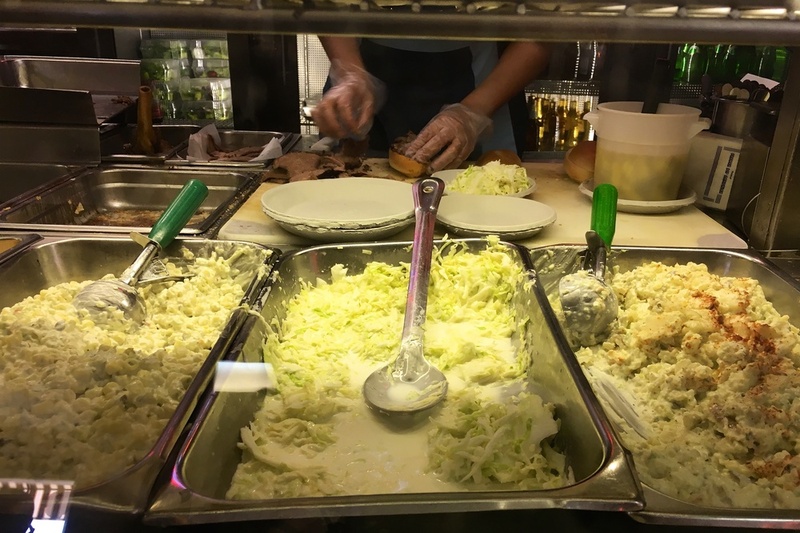 I was behind a very large order, but the carver behind the counter prepared that food quite quickly, and before too long, was wandering upstairs with our sandwiches and cole slaw. We both enjoyed our Lamb Dip (only single dipped), and feeling content, headed over to Union Station to catch the red line to Pershing Square. 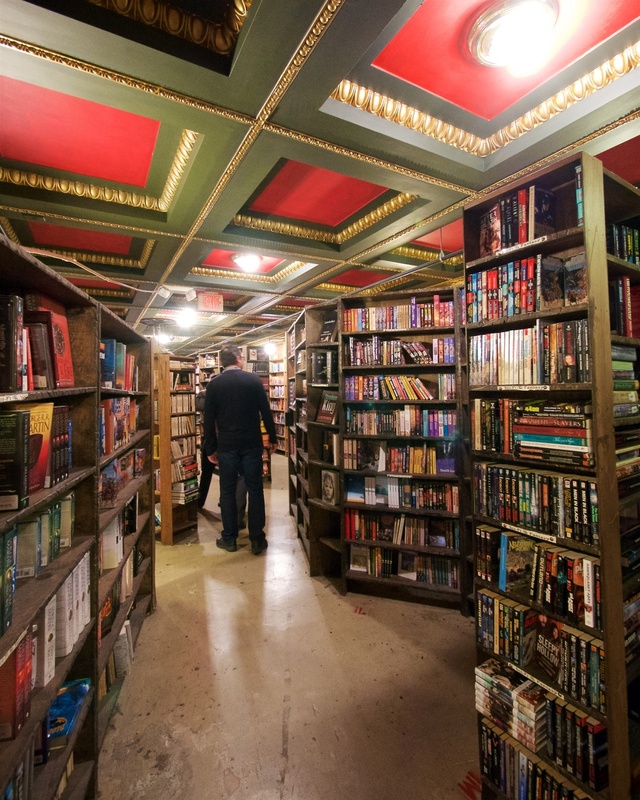 We had heard about the place for a while, so we were glad we finally made it to The Last Bookstore, an independent bookstore which is very quirky. It's in an old bank building (the whole area has many repurposed bank buildings), so the first floor is vast with huge columns in the middle. The mezzanine is very eclectic, with both art exhibits and a bunch of mismatched bookshelves. 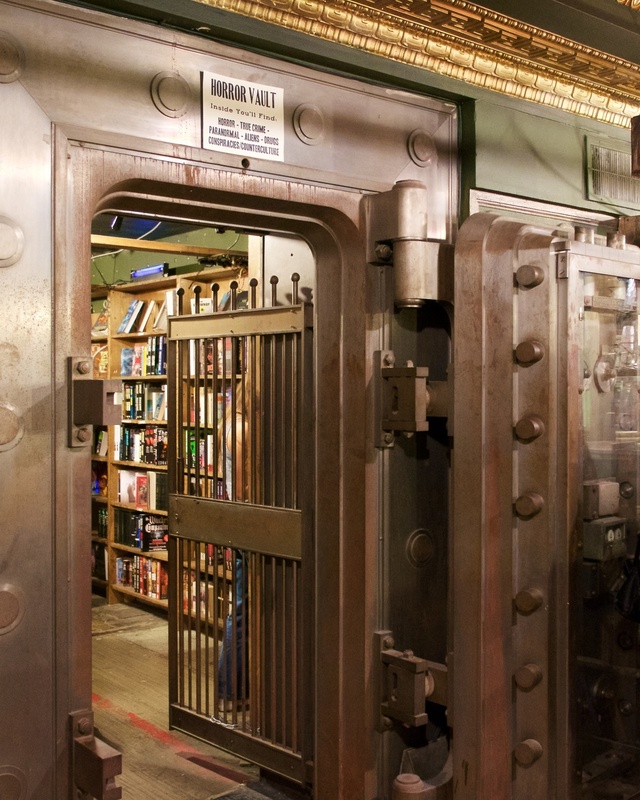 They also have a book tunnel, one bookshelf with books arranged so there's a hole through it, and vaults which have been repurposed for special collections (including a Horror Vault). Along one wall is a huge selection of vinyl records, and they also have a dedicated comics area. It's a very eclectic store, and we had fun wandering around in it. 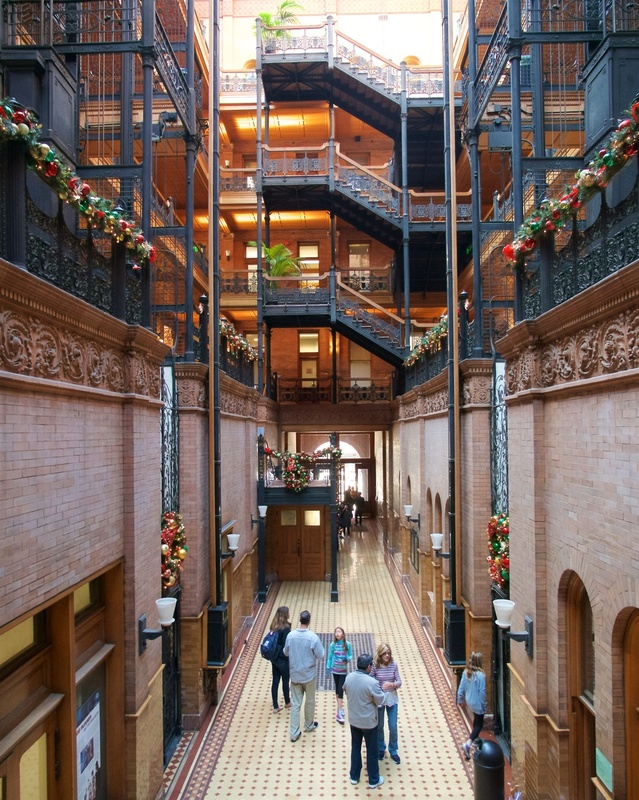 The next stop was the Bradbury Building looks very solid on the outside but is very intricate on the inside. It's been used in several movies (most notably Blade Runner), and it's easy to see why. 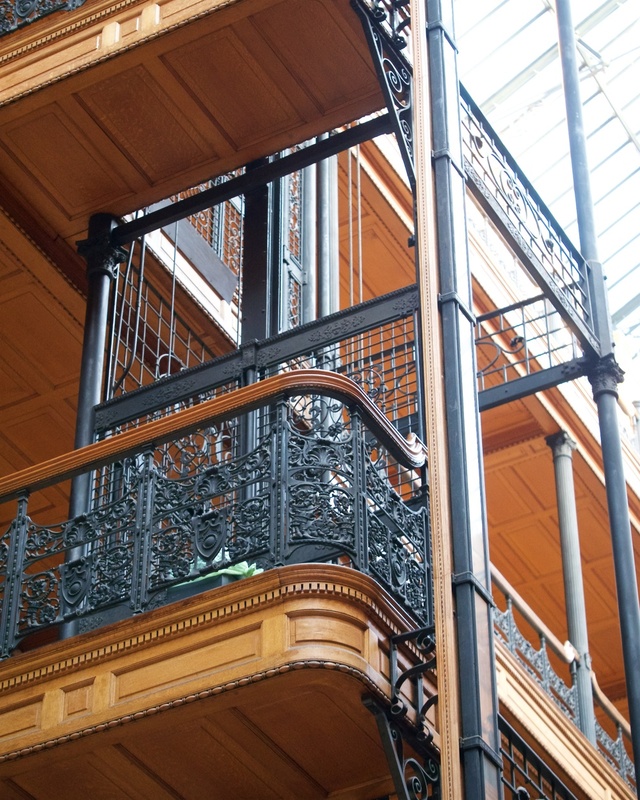 There's lots of ironwork, open cage elevators, and a large, skylit court with mezzanines for the other floors. The Bradbury is still being used as an office building, so we weren't able to go beyond the first-floor landings, but you can still see quite a bit from there and the main floor. Melody and I keep our eyes open for good ice cream stores, and it was no coincidence that we ended up close to one. Across the street from the Bradbury is Grand Central Market, so we walked there and wandered around the floor. The market feels similar to some of the markets we went to in Eastern Europe, or even Granville Island, where the only thing packed closer together than the vendors were the people walking in the aisles. Right in the middle of the market we found McConnell's Fine Ice Creams. Their main store is in Santa Barbara, but we didn't happen to go there when we were in that city many years ago. It was time to join the not-too-long line to make up for lost time. There were several flavors, including four seasonal ones. Melody got two of the latter while I got two of the regular ones (a single includes two small scoops, so you can have two flavors). We then started cruising around, looking for a place to sit. After being losing out a couple times, we found one near the exit and enjoyed our treats. The Market is in the middle of the block, but spans to both sides, so we exited the side opposite of where we entered and crossed the street to take a look at the Angels Flight funicular, which is currently closed. The current version of the train opened in 1996, but it was closed for nine years due to a fatal accident which exposed several design flaws. After reopening in 2010, it had almost 60,000 riders within the first month. Other than being ordered closed for a month in 2011 to replace old wheels, the ride continued to operate a car derailed in 2013; that accident exposed more design problems, as well as operational problems (a brake safety system was bypassed with a wooden stick). Funds are being raised to make repairs, secure insurance, and make the train operational again. A half block down was the light rail station, so we hopped on to the red line, transferring to the blue and then green lines back to the car. On the way back to the house, we stopped by the Downey Rose Float Association's barn to take a look at this year's float. We usually go closer to New Year's Eve, so what we saw was much further from the final product than we normally see. There were lots of people working on scaffolds, off to the side, and even on the floor. We got home in the late afternoon and took the opportunity to relax a bit before dinner. My aunt also came, and we enjoyed the last night together. Not a very eventful morning; after breakfast, we finished packing (including mochi for the kids and ozōni), then my parents dropped us off at the airport. We had some time to kill, but as it ends up, we kept ourselves occupied enough that we didn't even notice. The last several times I flew via Los Angeles International was through Terminal 6, and the food options were pretty limited. The last time, I was able to find a tunnel to Terminal 7, which had a much larger selection. This time, we were in Terminal 5 which was pretty good, and Terminal 6 had completely different restaurants in it which looked pretty good. However, since the walk was pretty far (and I was carrying quite a bit of mochi in my bag) we stayed in Terminal 6 and had grilled sandwiches for an early lunch. A bit more waiting, then we boarded our flight and were on our way to Seattle. 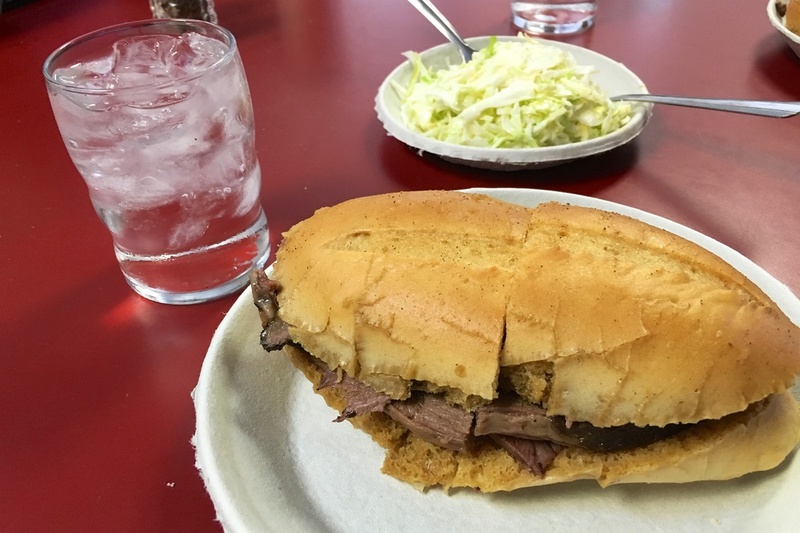 Because of our arrival time, we figured we might need to buy dinner right after we land, but since we touched down quite a bit early, we hopped on the train, caught a commuter bus, and were able to eat at home. Compared to our normal routine, it was quite a whirlwind trip, but we both had a good time and were glad to be home.